What Is a DC Compressor? 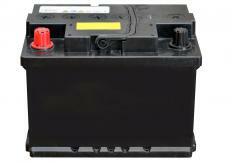 A DC compressor receives power from a car's battery for pumping air into items. A direct current (DC) compressor is a specialized, portable machine that receives power from a car's battery for pumping air into items, such as an air tool or a flat tire. Most generic compressors are large and heavy; they are not suited for placing in the back of a truck or car trunk. The DC compressor, on the other hand, is designed to be small and compact for reliable use on the road. Compressors use an internal motor, complete with piston action, to force air into the machine's tank. As air accumulates inside the tank, the molecules become more compact and dense. When the compressor is attached to an item, like a flat tire, the pressurized air releases into the item for inflation. The air's movement is extremely rapid, causing the tire to fill quickly; this is especially helpful on busy roads or highways where a vehicle breakdown can be very dangerous. The DC compressor varies from a compressor that is normally powered by either gas or electricity. In fact, this portable compressor usually comes standard with alligator clips. These "V" shaped clips attach to the positive and negative posts on the vehicle's battery for instant power. Consumers should use caution while attaching the clips since electrical shock can easily occur, causing injury or even death. There are two main drawbacks to this compressor type — low battery power and tank size. A vehicle with an older battery may have enough voltage to run the car's normal electrical system, but adding the DC compressor may cause it to produce reduced air volumes, or it may not function at all. The consumer should make sure that the vehicle's battery is relatively new to generate enough supplemental energy for the DC compressor. At times, it may seem that the compressor is malfunctioning when it is truly a lack of battery power. Since this is a portable compressor, the tank is relatively small. A DC compressor will need to run more frequently to keep the tank filled during use. As an alternative, some DC compressors are considered to be tankless. These compressors simply generate pressurized air on demand, but require a stronger motor to handle the extra work. The small size of the DC compressor generates a lot of residual heat. Many compressor users add forced air systems to the machine's outside housing. This cooling system pushes cool outside air against the compressor, keeping the motor components cool. Reducing the heat on the compressor will allow it to have a longer lifespan. What Is a Compact Compressor? What Is Synthetic Compressor Oil? What is a Compressor Valve? What is a Portable Tire Inflator? How do I Choose the Best Tire Inflator?